Remember to take a visit here. They have an incredible mummy exhibit. Thank you for a magnificent year! I loved experiencing art with your children.I've learned so much and I hope that they have,too. I've posted 3 videos. Click on through the photo stream.Enjoy. next year in order to get the most light for them to work with. extra dimension for them.It was softly lit fort. an artist came in wide with wonder saying"This is how real artists draw"
Your artist or famous artist? Insects were created and finished by the Three year old classes. Monday via their classroom teachers. Last days of mixing colors for a couple of Kindergarten boys. This was a favorite area for them each time they came to class. said in a sweet voice: "Miss Julie, I want to fly." artists. She emulates what I believe in. Children learn by doing. They are naturally creative. If they are given a space in which to work, beautiful things will happen. I will continue to grow with our artists by listening to them and exchanging ideas throughout our time together. Looking through the blue looking glass. the light was endlessly interesting. give information that will stay and deepen for a lifetime. Sometimes the best idea is so simple and easy that you forget about it. As an artist I always sketch. Jotting down an idea on a scrap of paper while I am out and about. Many times loosing what I have drawn. Therefore I bought a little sketchbook to paste or draw things in. This brought up the idea for using this concept with my young artists. 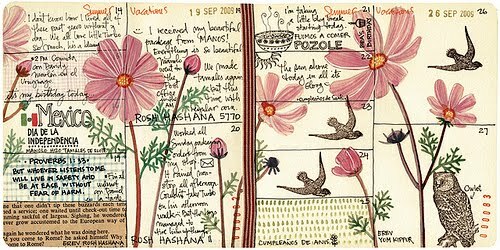 I also came across a great website showing ideas and the importance of a sketchbook. The children come into The Studio drawing and painting on small pieces of paper. These impromptu ideas are very original and very important to the artists. So, a few months ago the 3s.4s and K made a small sketchbook to draw in. Sometimes we drew from life. Flowers, a large bird house and a wooden mannequin are some of the things that we drew from life. Other times were drawing from our imaginations. These are two very different ways to draw. Both are important. The first day that they drew in their books, they immediately wanted to take them home to show to their parents. I told them that we were going to work on them for a while before they took them home. Well, they were hesitant, but ended up acquiescing to me and waited. They were very happy to come in each week and find a book with their name on it. The time has come to send them home. The only unfortunate thing is that some of the pictures were not drawn in a specific order. So, I don't have a list for you to know what we were doing each day. But, please know that your child loves this book and they can easily add pages to it with a little help from you. The following website is about sketchbooks in schools. But, I believe that at home is just as important. p.s. Kindergarten boys are bringing their books home in a couple of more weeks.